Frank Lloyd Wright changed the way we build and the way we live. 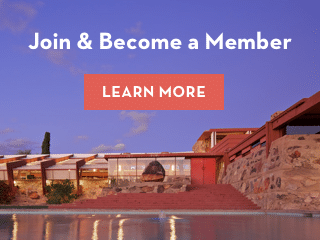 We use Wright’s revolutionary design concepts and buildings at Taliesin West to educate and inspire people of all ages, challenging them to understand and embrace innovation in their own lives. Combining creativity with academic relevance, the Frank Lloyd Wright Foundation’s innovative Summer Art and Architecture Camps give students the opportunity to think and work outside the box. Located at Taliesin West, Frank Lloyd Wright’s winter home and desert laboratory, the Summer Art and Architecture Camps will encourage students to explore, create, and design in the significant setting. Students will see how their unique ideas can have a true impact on the world around them, as they engage in the fun and educational activities. Hear why Ben is loving his summer Art & Architecture Camp at Taliesin West! Ben and his fellow campers are creating amazing dream homes, surrounded by the beauty of Frank Lloyd Wright’s desert laboratory. There are more camp opportunities available at Taliesin West this summer. Learn more at FrankLloydWright.org/camps. Full and half-day camps are offered to students in grades 2-12 throughout the summer, but the Foundation offers year-round education opportunities and field trips to the National Historic Landmark. For questions, please see the camp FAQs. Scholarships are available to qualifying campers. To complete the application form, please click here. Once completed, please send to SummerCamp@FrankLloydWright.org. For all other questions about Summer Art & Architecture Camps, please contact SummerCamp@FrankLloydWright.org. While in the Architectural Discovery camp, younger students will explore various aspects of architecture and learn about some of Frank Lloyd Wright’s most famous architectural concepts. Architecture-based activities and projects will promote the students’ creativity and imagination, while explaining the different patterns in nature and how the patterns influence architecture. Students will also get the opportunity to make an abstract art piece inspired by Wright’s stained glass. This camp is for students who will be entering 2 – 4 grades in fall 2019. The landmark architecture of Taliesin West is the backdrop for a weeklong photographic journey. Local Arizona photographer Andrew Pielage will guide students in capturing the Sonoran Desert and National Historic Landmark around them. Students learn the tools needed to best utilize a camera including aperture, shutter speed, and ISO, while applying creative approaches to composition, image framing, and the challenges of light and shadow. (Limited to 10 students) Students must provide their own fully manual camera and corresponding USB cable. It is highly encouraged that students provide their own laptop for editing photographs. This camp is for students who will be entering 7 – 12 grades in fall 2019. Students become junior architects as they use art, math, science, and language to create innovative spaces. This immersive program takes students through the steps of architectural creation – from concept to execution – of a fully detailed three-dimensional model of their own compact dream space. Dealing with the needs and desires of clients, environmental and sustainability concerns, and questions about color and style are part of the daily life of an architect. Students will discover how careful consideration each of these elements contribute to a great design. This camp is for students who will be entering 5 – 8 grades in fall 2019. Students explore how to respond to real world challenges such as global warming, pollution, new trends in energy and communication technologies, advancements in construction methods, and new modes of transportation in this project-based camp. As the student’s research exciting, newly constructed concept buildings and cutting-edge architects, they’ll work in teams to develop thoughtful plans for cities of the future. This camp is for students who will be entering 6 – 9 grades in fall 2019. Camp participants will study the planet Mars while they collaboratively tackle some of the same challenges confronting scientists in their effort to travel and live on Mars. Students will learn about Wright’s futuristic concept of Broadacre City, as they investigate how to create a new community that meets their needs for food, water, power, and shelter. At the end of the project week, the students use their 2D plans to create a 3D model their new colony on Mars. A former NASA employee will meet with campers for a discussion on these topics. This camp is for students who will be entering 5 – 8 grades in fall 2019. New field trip programs and resources are coming soon! Our tour program focuses on organic design, Wright’s works in Arizona, the architecture of the site, and how to apply this to the future. Frank Lloyd Wright’s talent for creatively linking indoor and outdoor spaces is on display in this engaging exploration of Taliesin West. Stops include visits to the “Garden Room,” the drafting studio, the Music Pavilion, and the Cabaret Theater, Kiva, and Wright’s private office, all of which highlight the dramatic beauty of Taliesin West’s landscaped grounds and desert masonry structures. Reservations are required three weeks in advance for all school group tours. Offered weekly on Tuesday, Wednesday, and Thursday at 9:30 am. To schedule your school group tour contact fieldtrips@franklloydwright.org. For questions, please see the field trip FAQs below. For all other questions about the Field Trip programs, please contact Director of Education, Kevin Conley, at kconley@franklloydwright.org. Please check into the bookstore 15 minutes prior to the tour or program start time. Tours take place both indoors and outdoors. Comfortable clothing and shoes are advised, along with a hat, sunscreen, and a water bottle. During rainy days please have students wear rain coats. Taliesin West is a National Historic Landmark built between 1937 and 1959. As such, it was not designed or built to contemporary accessibility standards. The pathway for tours are not all paved and include gravel walkways, uneven steps and stairs. Narrow, steep-sloped ramps over steps are available for guests to use at their own discretion throughout the tour. Ramps are 26” in width with slopes ranging from 21 to 27 degrees. Do you have lunch facilities? We do not have an onsite location to store or eat lunches.